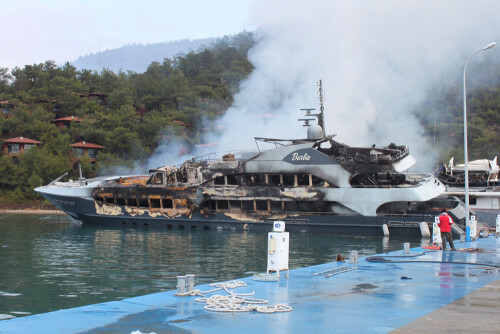 The owner of Barbie, one of two yachts destroyed in a fire in Turkey in January, has just received his insurance check for the gutted superyacht. A group of 14 Lloyd’s insurers paid the $20 million within 60 days of the fire. The yacht, which Al Jadaf built in 2006 at its Dubai shipyard in the United Arab Emirates, was destroyed Jan. 4 after a fire broke out on The One, a 233-foot superyacht that Lurssen built in 1973. Both were moored in Marmaris harbor. The fire quickly spread to the neighboring Barbie. “Barbie is the largest claim that the superyacht insurance market has had to deal with in quite some time. That it was paid in full within 60 days of the event will hopefully help the owner to reach closure from this traumatic incident,” Hiscox MGA director of underwriting Paul Miller said in a statement.